Tesla CEO Elon Musk has taken to his favorite social media and communications platform to share details regarding the new Tesla Model 3 Performance & AWD option Tesla is rolling out. Aside from what you will find in the Model 3 configurator, Mr. Elon responded to some of the many tweeted questions with extra details and a little bit of his special Elon marketing. I’ll start with perhaps the most interesting note. First, though: Steve Bakker has written a couple of in-depth pieces for us on AC induction motors and the base Tesla Model 3 motor. I highly recommend reading those for some background if these details interest you at all. Elon closed the loop on Steve’s remaining inquiries (I think) by noting that the Tesla Model 3 with all-wheel drive (AWD) will have an AC induction motor in the front and a switched reluctance, partial permanent magnet motor in the rear. He added that there are silicon carbide inverters in both of them. “Performance drive units are lot sorted for highest sigma output & get double the burn-in,” he also noted. I’ll leave it to Steve to unpack those comments and put them in proper English at a later point in time, but it all seems quite interesting at first glance, and it’s cool that Mr. Elon is providing such info up front now so that people don’t have to spend weeks upon weeks researching and speculating about such things. Also, carbon fiber spoiler, 20” Performance wheels, black & white interior. If you’re aching for the white interior but don’t want the AWD or performance abilities that are rolling out now, you may be a bit disappointed to see that you can currently only get white if you get the higher priced trim. That said, Elon is good to add the explanation that this is just a supply limitation and those with patience will be rewarded with a beautiful, vegan, white interior option at a later point in time (if you can wait that long to order your Model 3). I don’t want the Tesla Model 3 Performance package, but I am tempted to hold out a bit longer for the white interior. Or not. Black & white interior available only for Model 3 Performance initially due to limited parts availability. Will broaden over time. But hey, where’s the answer to how fast the performance version of the Model 3 can go? That’s in the headline, of course, but in case you somehow skimmed over that, the magic figure is apparently 3.5 seconds to 60 mph (100 km/h). Tesla’s official figures have been broken in the past, so expect to see a lower number than that at some point. Drag Times should be setting a quicker time a few hours after receiving the car, I assume. 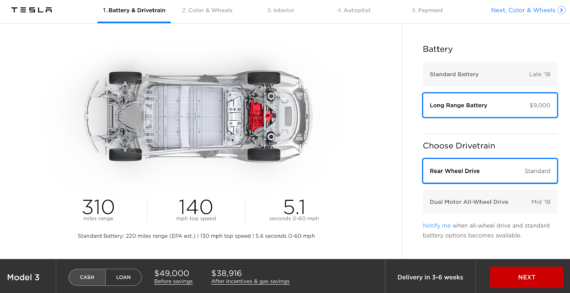 By the way, who can order a Tesla Model 3 Performance with AWD? Well, it must still be a super select group of reservation holders. I got invited to order my Model 3 over a month ago and I still don’t have the option. Anyhow, I imagine others like me who have reservations ready to be fulfilled will have the option to add AWD and higher performance any day … or hour. Tesla surely wants to sell this version as much as possible for the higher margins. Depends on when you placed your initial reservation. We start delivering the dual motor Model 3 in July. As can be presumed, $78,000 surely jumps out to many people as insanely expensive, but as Mr. Elon is often keen to do, he puts it all in proper perspective. If you wanted to get a hugely popular but slower and less impressive BMW M3, you’d pay a similar price. The question is, why would anyone buy a BMW M3 at this point? I honestly don’t have any opinions on that which don’t involve insulting the M3 buyers, so I won’t comment. What could actually beat the Model 3 in terms of drive quality? In Mr. Elon’s opinion, only the Model S.
They are correct. It’s awesome. Second best driving feel of any car in the world imo, apart from Model S. Traction control precision is super tight. Upgrade to the latest S. Nothing will give you greater joy. It’s like being able to have dopamine jacked straight into your brain at will. And that, kind sir, is what you call Elon marketing. Someone should hire that guy to sell something. Flamethrowers, candy, hats — anything! Lucky for us, he’s on the side of cleantech and cutting emissions that prematurely kill people and that might turn our planet into a burnt kofta ball. More goodies: the car will drive fine if one motor fails, one of the motors is optimized for power while one is optimized for range, and the normal dual-motor Model 3 (not the Performance one) accelerates to 60 mph in 4.5 seconds. That is true. Electric motors are far more reliable than combustion engines. You need an electric motor just to start a gas engine! Deliveries of the high-performance AWD Tesla Model 3 begin in July. They can form a union whenever they want & there’s nothing I can do to stop them. California is a very pro-union state. They just don’t want to.